This solar-powered SCHWAIGER outdoor siren can be operated without any need for additional power supply. 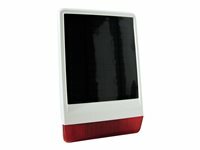 Due to the large solar panel, the device can be easily installed outdoors on any light-intensive spot desired. The siren communicates with the gateway via the wireless Z-Wave plus network and can be integrated into scenes. It is equipped with a loud alarm tone, flashing LEDs and protection against tampering.